RBTH presents a selection of views from leading Russian media on international events, featuring a report on large-scale NATO exercises in Europe, as well as analysis of the risk of renewed conflict in the Transcaucasian region and an interview with former U.S. Ambassador to Russia Jack Matlock about the putsch of August 1991 in the Soviet Union. The Kommersant business daily reports that NATO is holding airborne exercises by the name of Swift Response 15 in four European countries: Germany, Romania, Bulgaria and Italy. Almost 5,000 military personnel from 11 countries are participating in the drills. According to the alliance's general command, these exercises are the largest that NATO has organized since the end of the Cold War. 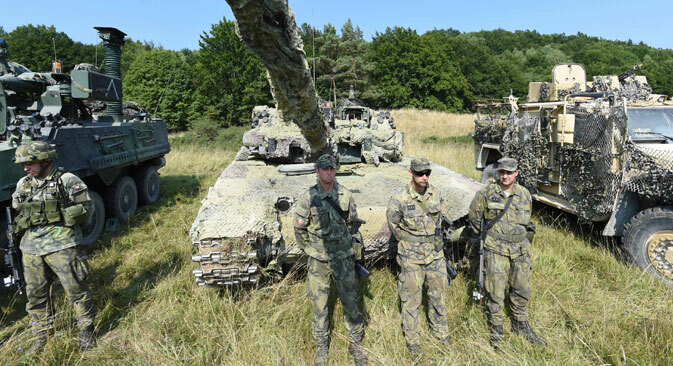 The exercises are aimed at increasing the interoperability of NATO forces, “which are on high alert," and the maneuvers are supposed to "demonstrate the alliance's capability to quickly deploy its forces and maintain a strong and defended Europe." The principal instruction is being given by the American 82nd airborne division. Earlier, experts from the European Leadership Network research center had stated that the military exercises that Russia and NATO are carrying out near each other's borders are increasing the possibility of an armed conflict. They analyzed two significant recent episodes: Russia's verification of its armed forces' readiness in March and NATO's Union Shield exercises in Eastern Europe in June. "NATO's largest airborne exercises since World War II are supposed to send the world an eloquent message about the alliance's peacefulness," commented Chairman of the State Duma Committee on International Affairs Alexei Pushkov on his Twitter account. The online newspaper Gazeta.ru analyzes a Minchenko Consulting report that has evaluated the political risks in the South Caucasus region. The report says that after the Ukrainian political crisis and the conflict in the Donbass region of eastern Ukraine the situation in the entire post-Soviet zone has worsened. Furthermore, competition between the European and Eurasian integration projects is growing. In total, six armed conflicts have taken place in the Caucasus (both north and south) since the collapse of the USSR, and most of them cannot be considered fully settled. Half of all unrecognized countries from the post-Soviet zone are located in the region: Abkhazia, South Ossetia, and Nagorno-Karabakh. Moreover, out of all the regions of the former Soviet Union, only in the Caucasus do bordering countries lack diplomatic relations. The report evaluates the political risks for national political systems of three Transcaucasian countries: Azerbaijan, Georgia and Armenia. They are evaluated by their stability in domestic and foreign policy, economy and capability in countering radical Islam. Armenia is considered the country with the highest risks, with its main problems being political and economic isolation, the unsettled Nagorno-Karabakh conflict, growing social protests and the risks of balancing its relations with ally Russia and partnership with the West. August 19 marks the 24th anniversary of the 1991 coup that led to the collapse of the Soviet Union. One of America's best-known diplomats, former U.S. Ambassador to Russia Jack Matlock, has revealed in an interview with the Komsomolskaya Pravda tabloid newspaper how Washington had warned Yeltsin and Gorbachev about the upcoming putsch. "In June 1991 I invited Moscow mayor Gavril Popov to have a business lunch. He told me that a putsch was being prepared against Gorbachev and that he wanted Yeltsin, who at that time was in Washington, to return to Moscow. All this information was exchanged via notes, since we were afraid of being overheard." "In Washington I was told that President Bush was insisting that I somehow inform Gorbachev. I passed the information to Chernyayev, Gorbachev's assistant, but I think the General Secretary did not give it much thought. Gorbachev then responded through Chernyayev and gave a speech about those naïve Americans. 'You did what you had to do,' he said. 'Thank you for coming. President Bush proved that he is our friend. Do not worry.'" "A day later Bush called Gorbachev. He asked if Gorbachev had met with the American ambassador. Gorbachev said yes and added: 'Everything that the ambassador said is one thousand percent false.'" "After the GKChP's (The State Committee on the State of Emergency) unsuccessful attempt to remove Gorbachev, Popov stated: 'In the end it all helped. From Gorbachev's telephone call with Bush, Kryuchkov understood that there had been a leak of information and stopped preparations for the putsch. Possibly, this is why the coup failed." "This all proves that in big politics some events take place just by chance."